After the interesting interview to Katie Greenaway from Olio di Oliva and Sogni di vino, this week I would like to share with you the experience of a skilled travel writer. I am pleased to welcome the guest post of Jessica Spiegel from WhyGo Italy, who will give suggestions about What to do during summer days in Italy. Take note!!! No matter how many travel experts recommend visiting Italy in the spring or fall, summer remains the most popular time of year to visit the country. Nevermind that airfare is at its peak price-wise during the summer months - it's when the majority of people have the time to travel because of work or school schedules. And if it's a choice between going to Italy in the summer or not going at all, well, I think I'd pick the summer. Among the many reasons seasoned travelers try to avoid summer travel in Italy is the fact that it can get downright hot throughout much of the country in the summer months - and high temperatures, often coupled with high humidity, can make sight-seeing uncomfortable. Discomfort at home is one thing, but discomfort while you're traveling is especially annoying and at the very least it can leave you with unhappy memories of your vacation. Those of us who love Italy want you to enjoy your visit no matter when you plan your trip. If the only time you can travel is during the summer, therefore, I want to make sure you aren't inconvenienced or (even worse) sickened by the potentially hot weather. Here are five tips to help you plan and enjoy a summer trip to Italy. Even on days when it seems like it's hot all day long, there is a stretch of several hours in the middle of the day when temperatures are at their peak. You may notice that during the heat of midday the locals have the good sense to be indoors (or at least relaxing), but as travelers you might feel like you have to constantly be doing something during your vacation - lounging around in the afternoon heat means you're missing out on seeing something, right? 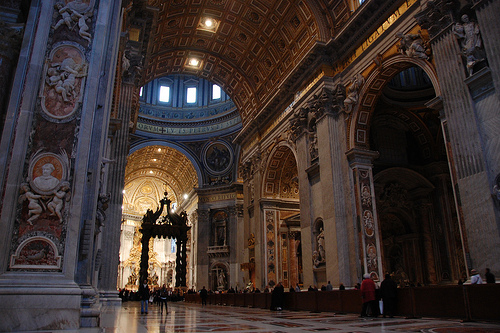 For those of you who don't want to take afternoon breaks to relax during the hottest part of the day, I have this advice - plan your days so that tours of churches are done during those hottest hours. Churches in particular are excellent places to escape the sun, especially when they're cavernous spaces with stone walls several feet thick. No air conditioning is required, they're naturally cool. When you exhaust your list of churches to visit, check out any small museum in town - even if they're not air conditioned, they're sometimes in older stone buildings with similar cooling properties to the churches. Oh, and don't forget - it might be hot, and you might think wearing shorts and tank-tops is the best attire to beat the heat, but in order to get into most churches in Italy you'll need to have knees and shoulders covered. In addition to bringing higher temperatures, summer also brings bigger crowds - so although lines at some attractions in Italy will be there year-round, they're even longer in the summer. I can't tell you how many times I've walked by long lines outside popular attractions like Rome's Colosseum or Florence's Uffizi, where people are nearly wilting from the heat as they wait to get in to see this must-see sight on their must-do list. The trouble is that by the time they get in to see what should be awe-inspiring, they're exhausted from the heat and just want to sit down. I can't make the lines disappear any more than I can turn down the thermostat in Italy in summer, but I can help you avoid waiting for 4-6 hours (or more) to see the Botticelli room in the Uffizi. All it requires is a little advance planning. You can buy tickets in advance for most of the big attractions in Italy, including the Colosseum and Uffizi mentioned above, as well as Florence's Accademia and Venice's St. Mark's Basilica. Sometimes booking an advance ticket will cost you a few euro above the ticket price of the museum, but it's especially worth it when the lines are hours long and the sun is baring down. Many attractions now have online booking options, while others still have phone numbers you have to call to reserve your tickets, and usually you can book up to a couple days in advance - so if you don't know your sight-seeing itinerary months in advance, you can often book tickets a few days before you arrive in a city, too. 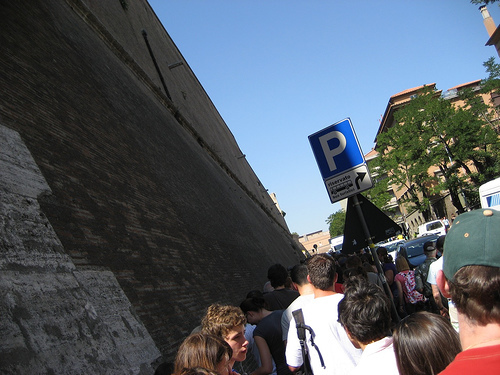 This article talks about how to avoid the long lines in Italy in three cities: Rome, Florence, and Venice. One of the mistakes travelers often make when it's hot out is letting themselves get dehydrated. It's easy to do, since you may not be used to downing massive amounts of water at home - but staying hydrated is even more important when you're out and about all day sight-seeing in hot and humid weather. If you're already toting around a small day-pack or a large-ish purse, you can probably fit a small water bottle in your bag. (You get bonus "being green" points if it's a refillable bottle you brought from home!) 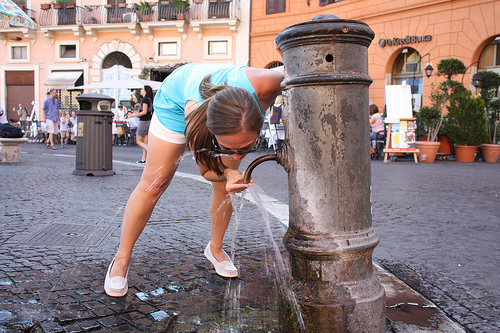 The tap water in Italy is perfectly fine to drink, and in some cities there are outdoor drinking fountains where you can fill up a water bottle with delicious and cold water. Rome in particular is famous for its drinking fountains, but even busy and bustling Milan has them. Whether you keep your water bottle topped off with tap water or drinking fountain water, you'll thank yourself later when you've successfully avoided the midday dehydration crash, crankiness, and headache. One of my favorite ways to cool down in Italy happens to be cheap and delicious - I'm talking about gelato. 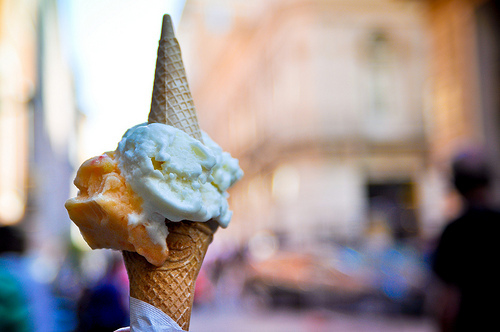 Almost regardless of where you are in Italy you'll find gelato shops, and one scoop typically costs €1-2. You can certainly get 2-3 scoops at a time if you like, but if it's really hot out it may melt before you can eat it. In that case, it's best to get one scoop at a time - and go back for seconds. Gelato may seem like it's too indulgent to enjoy more than once a day, but true Italian gelato is made with whole milk rather than cream, so it's less fattening. And if you're really counting calories, stick to the fruit flavors which often have little to no milk in them at all. You'll notice gelato shops are always busy in the summer months, and most have steady traffic year-round. Rather than being a treat reserved for special occasions, gelato is something Italians enjoy regularly - so there's no reason you shouldn't enjoy it regularly, too. Also note that depending on where you are in Italy there are favorite frozen goodies that are more local - so be on the lookout to see what the Italians around you are getting. Here are some tips on how to order gelato in Italy, as well as a list of Italian gelato flavors so you know what to order when you get there. The truth is that for many Italians, summer is when they themselves escape the cities - and the heat - and take their annual vacations. August in particular is the month when much of Italy shuts down, but even during June and July (and May, if it's hot) Italians will take advantage of any opportunity they can to get away from city heat. That usually means lots of weekend trips, especially if there's a long weekend on the calendar. The other option for some Italians, especially those who live closer to mountains than the coast, is to go into the mountains to escape the hottest weather. This isn't as popular a retreat as the beaches in Italy, but the country is also geographically blessed with some pretty incredible mountain ranges that are beautiful even when they're not full of skiers. So if all else fails and you can't stand the heat of an Italian summer, follow the lead of the locals and find the nearest beach. 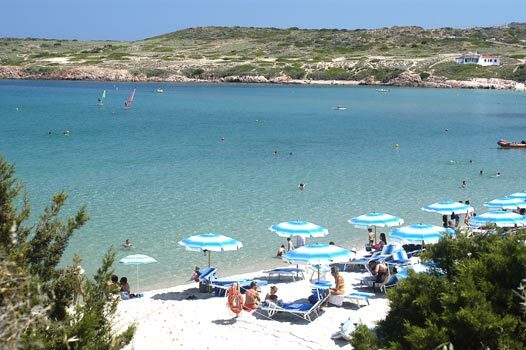 Be warned that occupancy rates skyrocket on the beaches in the summer, so you might have more trouble than usual finding a vacant hotel room - but once you're lying on an Italian beach under a big umbrella, fresh from a swim in the sea, you'll be glad you made the effort. Jessica Spiegel is the Italy expert at BootsnAll, and the woman behind BootsnAll's Italy travel guide: WhyGo Italy. She's happy to answer all kinds of Italy travel questions, from how to find cheap airfare to Italy to whether to buy an Italy rail pass to how to spend two weeks in Italy. 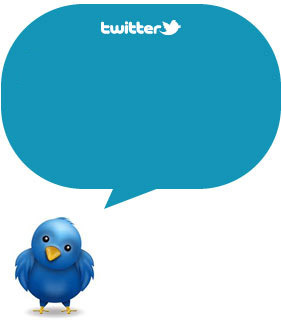 Subscribe to our RSS and follow us on Twitter and Facebook ! !